Lindy Mamabolo from @Couch Designs always had a passion for interior designs and décor but started working at a restaurants. She then worked for ABSA and later she joined Standard Bank. Her motivation to achieve more in life meant she was promoted sooner than her colleagues everywhere she worked. In 2012, she opened a furniture store while still employed by Standard Bank. She then resigned in 2015. She bought furniture, mainly couches and beds, from other manufactures around Johannesburg and sold the goods at her two stores in Lephalale and Mokopane. 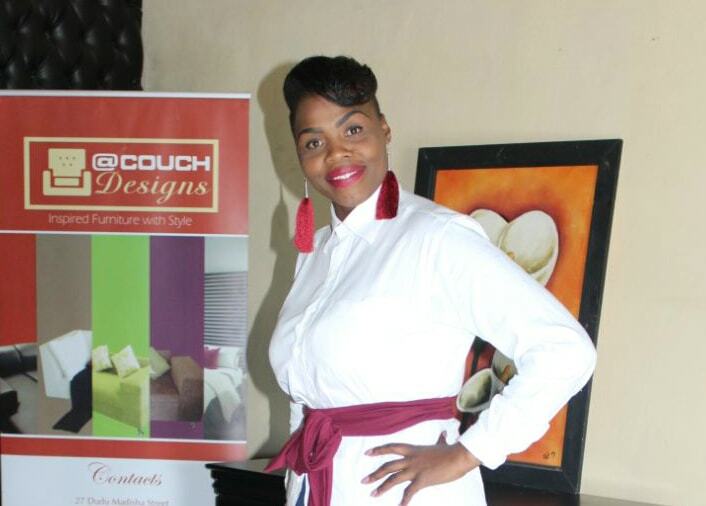 Today her company specializes in customised couches sold to retail outlets and she has expanded the business to produce headboards, ottomans and chest of drawers. In this interview, she shares excellent advice for startups and entrepreneurs. What prompted you to think this is the kind of company you should start? I started the company because I loved the world of interior design and décor. I knew I had to transit from a retail store to a manufacturing company. The plan was to set up a manufacturing plant to supply my own retail store to bypass the difficulties of dealing with suppliers from Joburg. Our local mine, Ivanhoe Platreef Resources, offered me a place on their Enterprise Development Programme. I was advised to fast track the manufacturing aspect of the business. What’s involved in setting up a business like this? You have to know how to create your own unique designs. This is essential to any furniture designer. You need a good eye for what customers want and a flair for tailoring your designs to their needs. However, besides being a skilled furniture designer and manufacturer, you'll also need to know how to manage a business in order to make your start-up profitable. The SAB Foundation Tholoana Programme helped me define my vision for my business. I've also had to think about funding it, setting up the manufacturing plant, marketing it and incorporating the fundamentals of good design into the furniture I make and sell. How is @ Couch Designs primarily financed and how will you continue to remain financially sustainable? @ Couch Designs survives mostly on our monthly sales we generate. We cater for two types of industries: household and corporate furniture, targeting walk-in customers as well as business to business clients. Initially, walk-in customers were our major customers until we were able to manufacture for targeted furniture retail stores. We've made a significant leap, engaging a client who owns 42 stores! Now we're in talks with our next big customer, which will require us to increase our capacity. What are your opportunities as a company? Fortunately, the opportunities for @ Couch Designs are substantial! The industry is constantly looking for new furniture manufactures. The current capacity of suppliers in the country can't quite keep up with the demand. Our vision is to manufacture to the world and not only South Africa. Firstly, we can achieve this big vision by supplying furniture to retail stores with a footprint beyond our borders. Secondly, we're planning to open an online store which has no limits in terms of distance. Every building needs furniture, whether it’s a house or a place of work. How many months or years did it take before became profitable? What have you learned in terms of marketing @ Couch Designs and getting it to your target market? Running your own business teaches you to think about business in terms of customer satisfaction. In other words, marketing has less to do with getting customers to pay for your product as it has to do with developing a demand for that product and fulfilling the customer’s needs. Word of mouth has been our most efficient marketing tool. In our line of business, referrals are key. When the customer is happy, they send their friends. Which entrepreneur/person has inspired you the most & why? T-bo Touch started at the bottom and built the strong brand that he is today. I'm especially impressed by his transition from being a radio presenter to a radio station owner. Touch is fearless, resilient, innovative and versatile. What has been your biggest waste of time or money in business? Employees who don’t know what they are doing cost me a lot. However, as a business owner, it's my responsibility to hire good staff. Additionally, it's my responsibility to train people to do the work well! Do you get help from our government or from other organisations? And what kinds of help do you get? SEDA and LEDA provide non-financial support, helping me with branding and attending exhibitions. The biggest support came from my Tholoana mentor, Ntando Maseko. He treated my business with the same enthusiasm as if it were his own. A good mentor unlocks one's business success. Getting into the Tholoana Programme boosted my confidence and did wonders for my skills development and turnover. Do you have any tips or advice for women who are looking to start their own couch designing company? If you want to start your business be prepared to work extra hard and don't let the notion that you are a woman keep you from reaching your full potential. You need to have an eye for finer things in life and the staying power to keep at it until you deliver the final finishing touch with excellent flair. Contact Lindy on +27 83 379 5999 or via email at lindy@couchdesigns.co.za. You can like her page on Facebook or visit her website. Lindiwe is proof that you can run a successful business when you apply your creativity and deliver quality products to your customers.